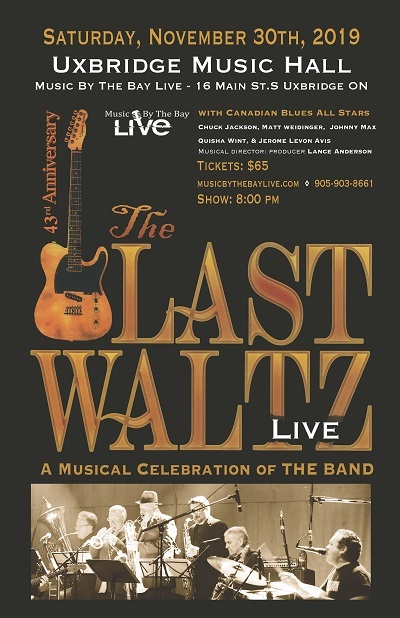 Music By The Bay Live presents: ‘The Last Waltz – A Musical Celebration of The BAND – Live’ celebrates the songs and music of the iconic Canadian band. By popular demand, one of Ontario’s most talked about acts returns to Music by the Bay Live. This all-star Canadian cast of award-winning blues and roots musicians, under the direction of Juno award winning producer and musical director, Lance Anderson, will be playing The Uxbridge Music Hall on November 30, 2019. They are celebrating the 43rd Anniversary of THE BAND’s last concert in 1976 and The BAND’s amazing contribution to our shared Canadian musical heritage. This show, has thrilled audiences at the Mariposa Folk Festival (2017), Beaches Jazz Festival (2017), Kitchener Blues Festival (2017) Ottawa City Folk Festival (2016), CNE Bandshell (2015) (Toronto) and Norfolk County Fair (2016) (Simcoe). It has also Sold Out theatres in Ottawa, Peterborough, Ajax, London, Orillia, Cobourg, Collingwood, (and more). In 2016, they completed a successful tour of Western Canada. Backed by a 9-piece band that includes Jerome Levon Avis, Terry Blersh on guitar, Dennis Pinhorn (The Hawks) on bass, Rob Gusevs (Blood, Sweat and Tears) on organ and Anderson (Joint Chiefs of Soul) on piano and vocals, this is a group of seasoned veterans who love the music. Anderson’s band also features a stellar four-piece horn section including David Dunlop (Boss Brass) on trumpet, Gord Meyers (Blood, Sweat and Tears) on trombone and tuba, Chris Murphy (The Maple Blues Band) on tenor sax and Simon Wallis (Lighthouse) on baritone sax. An all-star band! Please note, artists performing subject to change. All tickets are: $65.00 plus taxes, ticket fees and Music Hall Improvement Fund.